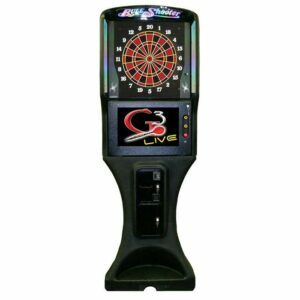 The latest bar dartboard from Arachnid, the Galaxy 3 features Dual “Flip” Dartboards + LED Lighting ! All the features you liked about the Galaxy 2 have been carried over to the new Galaxy 3 + all the new features ! are mounted on a rotating back board – Just Flip & Switch ! Also new is the LED Illuminated Dart Target and Marquee – Strips of LED Lights line the side of the cabinet giving the player a well-lit darthead to throw at. These same LED’s can be configured to display patterns of color to attract players to the game. ▪ New On-Screen “Player Feats” and Game Graphics ! ▪ New White + Multicolored LED Target Illumination ! ▪ Quick Flip / Adjustable 15″ and 13″ Dart Heads !